The latest statement of the US Secretary of State John Kerry indicates that Iran has been asked to bridge its relations with Saudi Arabia and visit Saudis soon. Kerry’s statement helps to understand that the visit of Iranian Foreign Minister Zarif to United Arab Emirates (UAE) is also a part of package deal that Iran had with P5+1. It looks that Iran can come out of regional isolation by taking steps for developing cordial relations with Sunni states of Middle East as its linking Middle Eastern leadership has backing of world powers those need to settle down volatile Middle East that is going out of the hands after unexpected and exceptional rise of so-called Islamic State (Daiesh). Iran signed a deal on July 14 with P5+1 to limit its sensitive nuclear activities in return for the lifting of crippling sanctions. P5+1 group that includes US, UK, France, China, Russia and Germany. An in depth discussion of US Secretary of State John Kerry at the US Council on Foreign Relations on Iran July 24 shared a lot of inside stories and credible information what actually happened before, during and after historic Iran Nuclear Deal. Kerry was of the view during this discussion that Iran wanted to continue its nuclear program because it felt that it was left alone in the world and nobody helped Iran when its population was gassed and when Iraq was killing its citizens. He confessed that Iran was very close to making nuclear bomb if it wished despite of sanctions and total cut off from the rest of the world. “They went to the ability to have 10 to 12 bombs with 12,000 kilograms. In other words, despite sanctions, despite everything that was offered, Iran continued its program because they believed deeply that they had a right to do this as an NPT country, to have a peaceful nuclear program, because they resented the fact the United States had supported Saddam Hussein in Iraq against them in the war, because they resented that when their people were gassed nobody took a resolution to the United Nations or represented them, and they felt they needed to have their own independent program because no one was going to come to their assistance”, said Kerry. Kerry indicated that unlike North Korea, Iran did not explode any nuclear device and the supreme leader of Iran had said we’re (Iranians) not going to seek a nuclear weapon. SECRETARY KERRY: But, look, I’ve been around this thing for a long time – 29 years in the Senate, and I’m very proud of the 100 percent voting record for Israel in the course of that time, and nobody I think has worked harder to try to bring peace to the Middle East or to Israel than I did over the last few years. I think I’ve had more meetings with an Israeli prime minister and more visits than any secretary of state in history. And I consider Bibi a friend, and we talk still and we disagree on this, obviously, and I’ve told him my feelings. But I feel them very strongly. I really believe that what we are doing – Richard says what are we gaining here – we’re gaining a safety and security, I believe, for Israel and the region that no alternative presents. And I ask you to think about the alternatives. People ask me, “Well, what happens after year 15? What happens 20 years and 25 years from now and so forth?” The fact is that if we don’t accept this agreement, if we don’t keep with this agreement and put it to the test, year 15 or year 20 comes tomorrow, literally. Because Iran already has enough nuclear material for 10 to 12 bombs. That’s what I found as secretary of state when I became Secretary. When President Obama became president, they had some four to five thousand centrifuges. They had already mastered the fuel cycle. They had enough fissile material to make a bomb. They were on their way to produce a plutonium, heavy-water reactor that could produce enough weapons-grade material on an annual basis for one or two bombs. So folks, everybody is missing this. This is not a question of what happens in 15 years or 20 years. This is a question of what happens now, tomorrow, if you don’t accept this deal, because Iran will go right back to its enriching. They’ve made that clear because they think they have a right. They are an NPT country. Unlike North Korea, they have not pulled out of the NPT. Unlike North Korea, they haven’t exploded any nuclear device and the supreme leader of Iran has said we’re not going to seek a nuclear weapon. Now, nothing in this agreement is based on trust – nothing. We’re not naive. We know the history. We know what Iran is doing in the region – Yemen, Iraq Shia militia, Hizballah. But the first order of business, my friends, if you’re going to confront them and push back, is to push back against an Iran that doesn’t have a nuclear weapon. Pretty simple equation. Now, I know there’s been a lot of railing through the years over their program, and people rant and rave. And we know we’ve seen the prime minister with a cartoon of a bomb at the UN and so on and so forth. But what’s happened? What has anybody done about it? Anybody got a plan to roll it back? Anybody got a plan that’s viable beyond bombing them for one or two days or three days that might slow their program down for two years or three years? To which, as most of you as practical human beings, you know what the response will be. I can remember Cyrus Vance and other moments of history. And he looked at me and he said, “John, let me tell you something directly. Iran will not get a nuclear weapon and I will do whatever is necessary, but I believe diplomacy has to be put to the test first.” War should be the last resort, not the first. Now, we have an agreement that six other countries have joined into, five of whom are our friends and allies, all of whom, with the exception of one, are nuclear countries – China, Russia, Germany, France, and Britain. They have experts just like we do. They understand the threat just like we do. And they have joined in this effort with the belief that we can adequately – more than adequately – track Iran’s program, know what they are doing, and hold them accountable. Let me just be very precise. 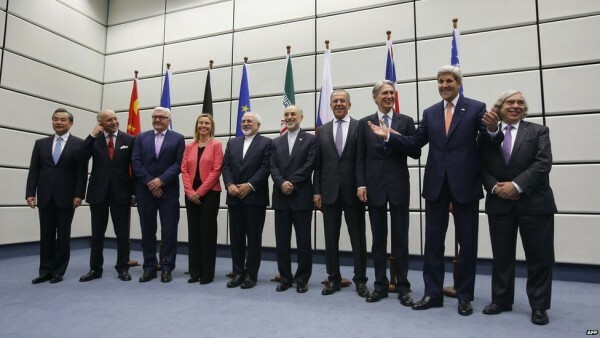 When we began these negotiations, folks, Iran had 19,000 centrifuges, 9,000 of which were spinning and working. When we began the negotiations, Iran had 12,000 kilograms of highly enriched uranium at 20 percent, which is enough for 10 to 12 bombs. When we began the negotiation, they were rushing headlong to the finishing of a heavy water plutonium reactor called Arak which would produce enough weapons-grade plutonium for one to two bombs a year. When we began this negotiation, we had no inspectors in there. The IAEA had been stiffed for years. We weren’t getting answers. We didn’t – we knew through intelligence what they’re doing, but not because we were seeing it. And when we began this negotiation, we had an underground facility at Qom called Fordow which was enriching, and we weren’t able to get into it. In the interim agreement that we negotiated in Geneva, their program was stopped cold. We rolled back Arak. They stopped any production on Arak. We gained 24-hour/7-day-a-week access to Fordow, Natanz, Arak, and we rolled back their production. Their R&D stopped. Their centrifuges stopped. They reduced the number functioning. And we began to have a regime. For two years now, they have lived by that. Two years now, they have lived by every facet of the interim agreement, and it has stopped and set back their program. So for Israel, for the region, we started with a two-month breakout time, folks. We’ve now pushed that breakout time up to maybe six months or so, and with this agreement for 10 years the breakout time will be one year or more. One year or more. Let’s ask you a very simple question: Is Israel safer with a one-year breakout time or a two-month breakout time? Frankly, two months is more than we need, but we want the cushion, the safety. And by the way, breakout time is different in this context than the normal arms control breakout time that we refer to. Breakout time historically – I was part of the Senate when we debated the MX missile and START treaty and all those things. Breakout time in most people’s minds refers to the amount of time it takes to get to the making of a bomb. We view breakout time much more conservatively in our application and seeking of this deal. Breakout time for us is the amount of time it takes to have enough fissile material for one bomb, but you still have to make and design the bomb. That takes a lot longer. So when we talk about a one-year breakout time, that’s for the fissile material for one bomb. And you tell me the country that if they decide to have a nuclear weapon is going to decide to make only one bomb. So we would have ample time to be able to respond if we had to, first with more sanctions, second with ultimatums, and third with the possibility of the military option if that’s what it really came down to. Now, and I’ll finish up very quickly here, the choice we face today is not really a choice between some plan that’s a fantasy – I mean, I’ve heard people say, “Why don’t you just ratchet up the sanctions?” Well, I’ll tell you why. Because China, Russia, and France and Germany and other countries don’t think that’s necessary if these guys are willing to negotiate and have a deal. People say crush them with sanctions. Well, folks, sanctions hasn’t done anything to stop their program. What it’s done is brought them to the table to negotiate, which is precisely what the sanctions were designed to do. I was chairman of the Foreign Relations Committee when we passed those sanctions, and the whole purpose of them was to make them negotiate. Read UN Resolution 1929, which says if Iran comes to the – which created the sanctions following on Resolution 1737, and it says that if Iran comes to the table to negotiate, all the sanctions will be lifted. To negotiate, not to conclude a deal. Well, we concluded a deal, and they argued, “You should be lifting all the sanctions.” And guess what? We haven’t. So I think there’s a lot of misinterpretation of what this deal is about and what it achieves for us. We, by virtue of this deal, will have a limitation on their stockpile of 300 kilograms, not 12,000. We will have a limitation for 15 years for that and for their enrichment at 3.67 percent. Folks, you cannot make a nuclear weapon with 300 kilograms and 3.67 percent. Physically impossible. We will have 24/7 inspection of all their declared facilities. Natanz, Fordow ceases to do any enrichment. There will be no fissile material there for 15 years. They have to – they’re turning it into a technology center, and they’ll have medical isotope research and other stuff. That’s it. The only enriching facility in Iran will be Natanz – open and visible. We will have a 20-year restriction on their centrifuge production, with live television cameras watching the rotors and bellows and so forth so we have accountability. And quite extraordinarily, we have 25 years of cradle-to-grave accountability for their uranium – mining, milling, yellowcake production, gasification, centrifuge, and waste. That’s – in itself, our intelligence community tells us it will be physically impossible for them to have an entire covert, separate fuel-production capacity. And without it, folks, you can’t make a bomb. So you say what do we gain? We gain extraordinary insight and accountability to Iran’s program. We gain very specific access and ability to access. We gain restraints on their program for years, including R&D on advanced centrifuges, et cetera. Now, you’re all going to say, okay, what happens after that when those 15 years are over and there’s a transition? They become an NPT country. They earn their way back by providing this access and visibility. But we don’t give that up at year 15 because they have to pass and adopt and ratify the Additional Protocol before the end of the sanctions. And if they don’t, it’s a material breach of this agreement. We have the ability to snap back all of the sanctions, and again, what we negotiated is a unique arrangement where one nation alone – say, the United States, if we’re not happy, we can go to the Security Council and we alone can force a vote on the snapping back of those sanctions. And the vote is already structured in the UN resolution that was passed the other day as a reverse vote. The vote will be on whether or not to continue the lifting of the sanctions. So one country alone – the United States – could veto that vote and we don’t lift – we don’t continue the lifting and they all snap back. Unique. We also have a provision for unique access. The whole reason we are in this fight with Iran is we have never been able to close the process of the IAEA and the IAEA questions have gone unanswered. So I sat there and I said we’re not going to negotiate our way into a continuation of this farce. We have to be able to close the IAEA process. So we have a unique process by which five of us out of eight on the Joint Commission – and the Joint Commission are all the negotiating parties including Iran; we’re the implementers – but five of us, which means France, Germany, Britain and the EU high representative, can vote if they don’t provide us access to demand the access. And if they don’t provide it, they’re in material breach: we have all our options. Go to the UN, re-sanction them, or military option if that’s what people think we have to do. Now, I’m not here to tell you that we may not have a conflict someday with Iran. I don’t know. I’m not naive. We know all the illicit activities they’re engaged in, and part of the strategy that we have is to push back against those, and we’ve made it very clear to Iran. That’s why we held the Camp David summit with all of the GCC countries. And I am going to Doha in 10 days to meet with the GCC and lay out the next progression of our plan that works on counterterrorism, counterinsurgency, training of their special forces, counter-finance, all the things that Iran’s been doing in the region that we disagree with. We will now have the ability to be able to unify the Gulf world, and we hope Israel, push back against it in ways that it hasn’t been, and hold them accountable. Now, Rouhani and Zarif have indicated that they want to have a different relationship in the region. You know where Zarif is this weekend? In the United Arab Emirates meeting with the bin Zayeds. He has asked to meet with the Saudis. They want to try to negotiate a different relationship. I don’t know if that will work, folks, but I know it would be diplomatic malpractice not to try. And what happens is if the United States Congress unilaterally walks away from this arrangement that we have reached, we go right back to square one where we were with no alternative. Iran is enriching, we have no inspections, we have no ability to know what they’re doing, we don’t roll back their program, we’re right back where we were, and we are going to head to conflict. Because when they start to enrich, you can hear every presidential candidate in the country saying, “What are you going to do, Mr. President? They’re enriching.” And you know where that’s going to go. So folks, I’ve got to tell you if this continues, what I’m witnessing where there’s this fear that is governing the – and emotion that is governing people’s thinking about this program, I fear that what could happen is if Congress were to overturn it, our friends in Israel could actually wind up being more isolated and more blamed, and we would lose Europe and China and Russia with respect to whatever military action we might have to take because we will have turned our backs on a very legitimate program that allows us to put their program to the test over these next years. I’m not telling you they might not cheat, I’m not telling you they might not try to do something on the side; I don’t know. I do know that Ernie Moniz from MIT, who is our Energy Secretary and a nuclear physicist, tells me and our intelligence community tells me we have the ability to know what they are doing, because under the Additional Protocol, which is a lifetime under the IAEA, they will have to provide access. Under the Additional Protocol, there’s all kinds of transparency. And if they become an NPT regular order country – there are 189 of them – they will still have to provide a declaration of all of their activities which the IAEA checks. And guess what, since they’re an NPT country and they’re allowed to have only a civil nuclear program, peaceful, every one of their facilities are declared and we have access to them every single day. If they change their enrichment from 5 percent to 20 or 20 and above, every red light is going to go off, and we will know that the day it happens, and we will be able to take action to find out what they’re doing, why, and prevent any further exploitation. I’m sorry to do this, but in – on June 12th of 2008, under a cover note that was signed by the P5+1 foreign ministers, including Condoleezza Rice, the Bush Administration made a proposal that they suspend all their enrichment and reprocessing, and in exchange here’s what the Bush Administration would do: recognize Iran’s right to nuclear energy for peaceful purposes; treat Iran’s nuclear program in the same manner as that of any non-nuclear weapon state party to the NPT once international confidence in the exclusively peaceful nature of Iran’s program was restored; three, provide technical and financial assistance for peaceful nuclear energy, including state-of-the-art power reactors, support for R&D and legally binding fuel supply guarantees; improve relations with Iran and support Iran in playing an important and constructive role in international affairs; work with Iran and others in the region on confidence-building measures in regional security; reaffirmation of the obligation to refrain from the threat or use of force; steps towards normalization of trade and economic relations; energy partnerships; support for agricultural development; civilian projects; civil aviation cooperation; assistance in Iran’s economic and social development. All of that was offered in exchange for the suspension and stopping of the reprocessing, and then a negotiation. Well, guess what happened? Iran said no, we’re not going to stop suspension – we’re not going to stop our program. And the Administration – that was the end of the dialogue and Iran went from 123 centrifuges in 2003, from about 300 at this particular moment, to 19,000. They went to the ability to have 10 to 12 bombs with 12,000 kilograms. In other words, despite sanctions, despite everything that was offered, Iran continued its program because they believed deeply that they had a right to do this as an NPT country, to have a peaceful nuclear program, because they resented the fact the United States had supported Saddam Hussein in Iraq against them in the war, because they resented that when their people were gassed nobody took a resolution to the United Nations or represented them, and they felt they needed to have their own independent program because no one was going to come to their assistance. And Richard will confirm, I know, the degree to which Iran felt isolated by that and the sort of impact of the choices that were made during that period of time. So we’re trying to make up for that now. We’re where we are. We’re not blaming anybody. It was a good thing to say “don’t enrich;” it was the right place to start for sure. But they proved that the sanctions weren’t going to stop them. You’re not going to sanction them into submission – nobody is. And here’s the problem: We have a deal now which six other nations have joined us in putting together and believe in, and if we unilaterally walk away from it, folks, the sanctions are gone, the inspections are gone, verification gone, Iran starts its program again, and you ask yourself what’s the next step after that. That’s where we are. MR HAASS: I didn’t realize when we agreed to a question-and-answer format, we were going to get just that, you were going to take me so literally. (Laughter.) So let’s – you’ve put a tremendous amount on the table. Thank you. And so let’s drill down a little bit. You’re right in talking about how the program, the capacity has built up. But do you – in one bone of your body, do you seriously believe that Iran is doing all this because it’s interested in peaceful uses of nuclear energy, that they want to generate electricity? Isn’t all of this about putting into place the prerequisites of a military program to produce nuclear weapons? SECRETARY KERRY: Well, if it – they already have that. That’s what I just described to you. They already have that. I mean, the horse is out of the barn on that one. So we’re rolling the program back so we build the confidence about our ability to have insight as to what they’re doing. So the choice is whether or not you are going to build up a system that gives you access and insight or whether you decide that’s not worth it, let’s just go to war now. I mean, that’s really where you’re at in this fundamentally. Because I mean, do you think the ayatollah is going to come back to the table if Congress refuses this and negotiate again? Do you think that they’re going to sit there and other people in the world are going to say, “Hey, let’s go negotiate with the United States, they have 535 secretaries of state”? (Laughter.) I mean, please. I would be embarrassed to try to go out. I mean, what am I going to say to people after this as Secretary of State? “Come negotiate with us.” “Oh, can you deliver?” Please. So the choice, Richard, is not – it’s not sort of – we have an ability here to put in place what 189 nations live by and for 15 years. Let me tell you what these guys are willing to do. They’re going to roll back their centrifuges that are currently deployed from 19,000 to 6,000 for five years – 10 years, excuse me. They will restrict any research on advanced centrifuges for those 10 years. There’s a very limited amount, but it’s so limited it doesn’t take you to any practical deployment. They will reduce their stockpile of enriched uranium down to 300 kilograms for 15 years. They’ll limit their enrichment to the 3.67 percent for 15 years. So you know you can get no bomb possible for at least that period of time, and we respectfully submit to people that it is forever. And the reason is we will have 24/7 visibility on their civil nuclear program, and you can’t break out and start enriching without our knowing it. SECRETARY KERRY: That’s the simple reality. MR HAASS: But as the President himself acknowledged, after 10 or 15 years they are no longer under size constraints on their centrifuge or enrichment programs. MR HAASS: There’ll be monitoring. So – and that as he said, breakout time, which as you said grows in the initial years of the agreement, then begins to shrink. SECRETARY KERRY: To build confidence, but then it does shrink. Correct. SECRETARY KERRY: But it never shrinks – there’s no such thing as zero. The breakout time goes down to always somewhere in the vicinity of a month or two because it just takes that long to enrich. And remember what I said: breakout time is enrichment to enough fissile material for one bomb. We will see them doing that. And it’s still a year or two years before they could, quote, “get a bomb.” So you have a choice here between them starting to go do that immediately, right now, or you go for the 15 years and whatever transformation and changes come within Iran at the moment. Now, take a look at this. I ask you – I mean, if you talk to our intelligence community, and a lot of your people are having conversations and we’re having people briefed – all of the former secretaries and others being fully briefed by the intel community. But the intel community will share with you, and I will today, the IRGC is wholly against this. IRGC doesn’t like this deal. And the reason the IRGC doesn’t like this deal and has been fighting it every step of the way is because it takes away the umbrella they had hoped to have for their nefarious activities in the region. That is why we have said strategic operative principle number one here ought to be don’t let them get a nuclear weapon. And we believe that the regimen being put in place, in fact, prevents them from being able to do that for the lifetime of their participation in this agreement. MR HAASS: Are you betting that over the course of this agreement that Iran does, in fact, change significantly? You used the word “transform.” And if it doesn’t, do you still believe this agreement is warranted? SECRETARY KERRY: No, I am not betting it. I’m suggesting that over 15 years, things happen in countries. And if you look at Iran today – very educated, used to be very friendly with a lot of nations in the region, including Israel. There’s a long history with Persia. And the reality is that those young people who are 20 percent unemployed want a future. I mean, you go to Tehran today – I haven’t been, but I have friends who’ve been and people who tell me it’s teeming with energy and young people who want to – they all have smartphones and they’re buying cars, and they want to be part of the world. I don’t know what happens in 15 years, except that I know a lot of things change in countries. And nobody could imagine what would happen with China when Nixon went. Nobody could happen – people objected to Reagan negotiating with the “evil empire.” I mean, if you don’t do these things, folks, you can’t create change, you don’t test possibilities. What I do know is this: If we turn our backs on this deal, folks, we’re sending one hell of a message to the hardliners in Iran. And they’ll feel good and we will see them – and Rouhani made – who knows what happens in an election. But Rouhani and Zarif, who have staked themselves on the potential of being able to negotiate with the West and being able to arrive at a conclusion, will be in serious trouble in my judgment. MR HAASS: I’m not going to get to most of my questions because I want to open things up, but let me ask one or two more. We talked about the long term. Are you prepared to work with Congress to potentially produce some language about what would be tolerable, and by definition intolerable or unacceptable, in terms of Iran’s long-term capabilities once the durations of this agreement expire? So in addition to a vote on the legislation, could you imagine some associated legislation, resolution, statements, that the Administration would work with Congress to basically put down some limits about the future? SECRETARY KERRY: Well, look, we’ll work with Congress in every way and any way possible. But I think the President has made it pretty clear that Iran will not get a nuclear weapon. He’s prepared to use military force if necessary in order to prevent that. And I will tell you in my conversations with the Iranians, we talked about it pretty directly, and they resent enormously any kind of threat. But I made it crystal clear that we had the capacity, and the President was prepared to use it. It’s not our first choice, which is why we’re there negotiating. So I think, Richard, we’re prepared to work with Congress in ways that would send the right kind of message. We would not want to send a message that, obviously, is counterproductive to the full implementation of the agreement and to the effective transparency and accountability with respect to it. Can I just leave everybody a couple other thoughts quickly here? (Laughter.) You need to also think about what the real prospect is in the long term for Shia Persia to have fertile ground in Sunni Arab countries. That’s not a easy mix. The Gulf states currently spend about $130 billion a year on their military. Saudi Arabia spends 80 billion. Iran spends 15 billion. So you got to think about – so what’s going on out there? What’s going on is that a lot of these countries have fancy toys, F-16s and missiles in different – missile defense. But they don’t have enough people on the ground who are prepared to fight, prepared to stand up and take the fight to the bad guys. And that’s why we’re engaged in this training concept and in this capacity-building concept, because when that gets built up, you have a very different equation in the region. So I think that we have a lot of possibilities here if we pursue them intelligently and don’t just react out of kind of gut fear about Iran, because I think our – the steps we have put in place respond to that fear. So we had a very real clarity about what we needed to get here. The President said we got to cut off the four pathways to a bomb: uranium – Natanz and Fordow; plutonium – Arak; and covert. Covert’s the toughest. But that’s why we negotiated the access and the snapback and the lifetime provisions with respect to the inspections. MR HAASS: Why were the limits or the bans on conventional arms sales and ballistic missile sales lifted over five and eight years at the same time that other issues that were not nuclear-specific, including American prisoners and hostages, Iranian terrorism, human rights abuses – why, in a sense, did we allow the agreement to be expanded in ways that looked to be helpful to Iran’s agenda but not to ours? SECRETARY KERRY: Well, I’m happy to answer that. If you read Resolution 1929, it is a nuclear resolution. It’s about the nuclear program. Susan Rice slipped the arms embargo thing in at the very last minute to the great consternation of Iran who felt that it had nothing to do with the nuclear program and didn’t belong in the resolution. So if you, again, read the paragraphs of the resolution as I cited earlier, it says specifically that if Iran comes to the table to negotiate, then the sanctions would be lifted. This is the argument Iran was making. The Russians and the Chinese supported that. So you had three of the seven nations that believed those things were extraneous to the nuclear provisions and we shouldn’t be renewing them. We had four nations – France, Germany, Britain, the United States – who felt otherwise because of Iran’s activities. We won. We kept them in for eight years on the missiles under Chapter – under Article 41, Chapter 7 of the United Nations and on the arms for five years. But those aren’t the only tools we have at our disposal, folks, to be able to deal with those issues. That’s what’s important. We have the missile control technology regime. We have the nuclear proliferation structure. We have multiple UN resolutions that prohibit Iran from transferring weapons to Hizballah, to the Shia militia in Iraq, to the Houthi, to Libya, to North Korea – all of which we can enforce. Now, let me underscore to everybody here: there are probably 70- to 80,000 missiles of one kind or another, rockets in Lebanon pointing at Israel, Tel Aviv. Those were put there before we began negotiating. For years nobody has pressed this issue, the transfer of these weapons, sufficiently. But we have begun to do that. A few months – a couple of months ago, I guess it was, when you saw a convoy coming down out of Iran heading towards Yemen, I was on the phone in an instant to my counterpart, and made it very, very clear that this could be a major confrontation, that we were not going to tolerate it. And he called me back, indeed, within a short span of time and said, “They will not land, they are not going to unload anything, they are not going to go out of international waters,” and then they went home. We sent the Roosevelt in, the U.S.S. Roosevelt, to interdict. We have interdicted. We interdicted weapons going from Iran through Sudan that were supposed to go to Hamas. So we are engaged now in a very active effort, and we will step that up even more significantly, in order to prevent these kinds of activities. But we have the authority, folks. Losing the missile thing in eight years, or losing it – which has nothing to do with the nuclear program – does not stop us from enforcing both tracks. And we will do so. MR HAASS: Do you think Iran ought to be now included in all sorts of regional diplomacy, say, about Syria, Iraq? And if so, do you come away – you’ve spent more time with the foreign minister than anyone has spent with any senior Iranian for decades. Do you see any reason to believe that we can expect any more flexible or restrained Iranian behavior in places like Syria? SECRETARY KERRY: I have no way to predict, Richard. Zarif did say to me – first of all, he did not have a portfolio to negotiate those issues, and I tried very hard to raise them on many occasions. But he did not have that portfolio. But both President Rouhani and Foreign Minister Zarif have made it clear that, with the agreement, they are prepared to discuss the regional issues. And I am – I welcome the fact that Foreign Minister Zarif is going to the Emirates and I welcome the fact that he is prepared to talk with the Saudis. I will be meeting with Foreign Minister Lavrov in Doha, and we hope to be following up on thoughts we have shared and are working on about Syria. And we want to bring the Saudis in, we want to bring the Turks in, and ultimately, probably, we have to see what the Iranians are prepared to do. But that is a – to deal with Daesh, to kill off Daesh, ISIL, which we intend to do, we have to change the dynamic of Syria. And that’s part of why we have been negotiating with Turkey in these last weeks and now have some shift in what the Turks are prepared to do, and there is also a shift in some of the things that we’re engaged in. So my judgement is that there are possibilities there, but I am not going to promise them. I can’t tell you where they will go and I am not betting on them. I am hopeful. MR HAASS: Okay, let’s open it up. My hunch is there will be more than a few questions. I see Ken Juster over here. Get a microphone right there. Just wait for the microphone, let us know who you are and where you work. QUESTION: Hi, I am Ken Juster with Warburg Pincus. Thank you very much, Mr. Secretary, for being here this morning, for presenting your position on the agreement. In fairness to some of your critics, we too prefer a diplomatic solution to a military one, but one area where some of us may disagree is believing that the United States and its negotiating partners should have had sufficient leverage to get more favorable terms in some key areas. While Iran’s stated alternative to its demands may have been to continue its march toward nuclear weapons, under the UN Security Council resolutions that would have increased its status as a pariah state. MR HAASS: Okay, got to come to a question. QUESTION: Yeah, yeah. So my question is if you could go through your reasoning on a few key provisions. For example, if you want Iran to comply with 10 to 15 years of obligations, in terms of its nuclear program, why did we frontload the sanctions relief? And I understand you have the snapback sanctions provision there, but doesn’t that provision have some flaws, in the sense that Iran already would have a huge injection of capital and the snapback provision would enable it to terminate the entire agreement, so it’s only going to be used in limited circumstances for a monumental breach? And then, finally, because we’re integrating Iran back into the international community, did you ever ask them to no longer call for the destruction of Israel? SECRETARY KERRY: Yes, to the last. And I also told them that their chants of “Death to America” and so forth are neither helpful and they’re pretty stupid. (Laughter.) And so we absolutely discussed those things. And by the way, we constantly talked about the American citizens, and we are continuing, even now, very directly engaged with respect to that. But with respect to the frontload, as you call it, we have – the dynamic of this negotiation was always going to be restraints on Iran’s program, access and accountability and transparency, verification – profoundly important verification going forward. And what brought them to the table was the sanctions; for them, it was always going to be relief from the sanctions. Now, Rouhani came to office principally on his promises to help deal with the economy. And he is somebody who believes in looking outwards and presenting a different Iran. So does Foreign Minister Zarif, who lived here in New York and was very involved at the United Nations for years, and many of you probably have met him and know him. So they want to see Iran re-emerge economically, and the trade was always our getting what we wanted with respect to nuclear satisfaction, and them getting what they wanted with respect to economic possibilities. Now, we even then were very restrained in what we did. We didn’t – there’s no signing bonus – (laughter) – there’s no sort of gift for saying you’ll do something. You have to do something to get anything. So every single bit of what I described – the 300 kilograms has to be reached; the 3.67 percent; the Arak calandria, which is the core of the Arak reactor, has to be taken out and filled with concrete; they have to dismantle all the centrifuges, two-thirds of them have to be taken out; piping and electrical has to be taken out; vast amount of infrastructure undone; we have to undo the centrifuges and the current activities of Fordow and create this lab, all of this has to be done; PMD has to be resolved — before they get one ounce of sanctions relief. Now, that could take six months, it could take a year. I don’t know how long. Depends how fast they do all of that. But the IAEA has to certify that all of that has been done and we have received our one-year breakout time before they get a dime. Now, let’s discuss whether it’s a dime or a dollar. It’s not 115 billion that they get. It’s certainly not the 150 you hear some people throwing around. It’s not even 100. They will get, in real money that they can actually access, somewhere in the vicinity of 50-plus million – billion dollars. That’s what they get. And the reason for that is there’s a whole lot of money within the other piece. Twenty billion is wrapped up in infrastructure and contracts to China, there are massive – tens of billions of dollars wrapped up in non-performing loans. There are a host of reasons why that money doesn’t come. But we’ve done a Treasury vet on that, very, very penetrating with our intel community. And by the way, none of that $50 billion is held in American banks. So folks, if this deal doesn’t go through and our allies walk away, which they’ve – which they will, as a result – we lose the sanctions and the money will still go to them without the ability to be able to know and see what’s going on in the country. So yeah, they’ll get the 50 billion-plus, which by the way, is their money. We’ve seconded it in the context of the sanctions, frozen it, but it is their money. And if China and Russia start to do business with them because they say well, the hell with the rest of these guys, you guys cut a deal, you’re not living by the deal, so we’re not bound – they’re going to do business. By the way, the French foreign minister is going in the next couple of days. The French commerce minister has already been there for a few days. The Germans are going in the next few days. There’s going to be a rush to do that. Now, on the sanctions, you asked about the snapback and so forth, we don’t have to snap back all of the sanctions. If you read the language it says, “in whole or in part.” We can restore them in whole or in part. So it’s not just a heavy club, it’s leverage that gives us great discretion as to what we think we need to do. And the reason we left time in between it is to do diplomacy. We had a problem on the – brief problem on the enforcement – not enforcement, but the implementation of the interim agreement. And we learned through our intelligence, by the way, without – by the way, we also learned that they had Fordow, with our intelligence. We learned in 2003 with our intelligence that they – and then through environmental swabs that they were, in fact, pursuing some nuclear activities where they shouldn’t have been. So that’s before we had all of the kind of inspections that we’re going to put in now. We’re going to have 150 additional inspectors going in under this who will be working out of an office that will be in Iran. So we’re going to have a massive infusion of info. But we wanted to leave time for diplomacy to work as it did in the interim agreement when I called Zarif and said, “Look, we’ve learned that there’s some gas that’s been put into an IR-5. You’re not allowed to do that.” And within 24 hours, folks, it was stopped and remedied. So that’s the process that we envision here, is a very high degree of combined intelligence gathering. Israel will be feeding information, other countries, with our own inspectors, with our own national technical means, our intelligence community has great confidence well beyond the 15 into the future we’re going to know what they’re doing. And we will know, by the way, by 15 years, folks, whether they’re serious, whether they’re playing games, what kind of hiccups there were in between, where’s the IRGC there, where’s Hizballah in 15 years, where are we in the whole Middle East. A lot of things can begin to happen. So you have a choice. You can try to test and get to those things, or you can go to year 15 tomorrow and have your clash now. That’s really what we’re looking at. After this, after the Middle East, you head to Havana to raise a flag at the embassy. For the embargo to be lifted against Cuba, the law requires that U.S. claims against Cuba be settled. What’s your position: Should the law be changed or should the claims be settled? SECRETARY KERRY: No, we’re already talking about claims, and claims are going to be part of the ongoing diplomatic discussion, and it’s very much on the table in the context of the normalization process. So we will discuss claims, we’ll discuss a whole bunch of other things. That’s why it will be hard. Nobody’s promising that that’s going to be quick and easy. But I do look forward to getting down there on the 14th to raise the flag. We’re going to have a couple of Marines with us who actually lowered the flag who are going to help raise it. QUESTION: Thank you very much, Mr. Secretary. How do you assess the likelihood of other states in the region now proceeding to buy a nuclear weapon? SECRETARY KERRY: I am going to give you a serious answer to that. I am absolutely convinced – totally – that the threat of other countries going for a weapon in the Middle East is greatest if you don’t have the deal than if you do. And the reason for that is very simple. If we don’t have this deal and Iran goes back to enriching, which they’ve said they’re going to do, and there are no inspections and we don’t know what is happening, the pressure that existed several years ago to go bomb them is going to mount and the potential of conflict grows, and if the Arab world is looking at an Iran that doesn’t have inspections, doesn’t have accountability, hasn’t reduced its stockpile, is proceeding headlong to enrich, that’s the incentive for them to go out and feel, “We’ve got to defend ourselves and put something together.” So I would say Egypt and Saudi Arabia and maybe Kuwait and others will quickly follow suit. But with this deal, they’ve told us if this deal does the things that we have laid out and they’re inspecting it and looking at it – Saudi Arabia just the other day with Ash Carter’s visit came out and said they believe it does, that it accomplishes the goal; the Emirates have told me they think it accomplishes the goal. But as long as they believe it does and we’re serious, number one, about implementing it fully, and number two, about pushing back against the other activities by working with them, they will not go after a weapon. MR HAASS: Okay, we’ve got – yes, ma’am, in the back. I see a hand back there. I’m sorry, no, the gentleman next to you. I apologize. Yes. I can’t see that far. Oh, Ian Bremmer. I’m sorry. QUESTION: Yeah, it’s Ian. Hey, Ian Bremmer. Question for you – got a grand strategy question, which is: We’re close, we’re on the track for two big breakthroughs – this Iran deal and also the Trans-Pacific Partnership – and I’m just kind of wondering in terms of the impact it has on the international system, the transformational impact, which would you say is more important and why? SECRETARY KERRY: Well, they’re two very different – I mean, they’re two very, very different things. They’re both very, very important to the Administration. We’re working extremely hard on TPP. TPP is critical to the rebalance to Asia which we’re very focused on. I mean, I’ve made X number of trips to the region and Tony Blinken now is following up and we’re really flooding the zone, so to speak. I’m going to Asia next week, actually, for the ASEAN meetings and so forth. So we’re deeply engaged in leveraging that because it represents 40 percent of global GDP. And if the rules are accepted by the standards that we’re putting into the TPP, we are raising the standards of international business, not racing to the bottom, which is what we fear would happen if others were writing those rules. So we had a very important meeting with the party leader of Vietnam recently, who came to Washington, where Mike Froman, Ambassador Froman’s over there and we’re negotiating out with the last countries and we’re very hopeful. July is a big month for that negotiation. But that is economic power and economic protection, and vital to America’s capacity to do all the other things we do. But the nuclear deal with Iran is straight security, literally day-to-day security and the structure of the potential of future relationships within the Middle East, which everybody knows has been on fire. Many of us believe that – and I’m not betting on it, I want to make that clear. I’m not saying this will be a consequence. But I know that a Middle East that is on fire is going to be more manageable with this deal and opens more potential for us to be able to try to deal with those fires, whether it’s Houthi in Yemen or ISIL in Syria and Iraq, than no deal and the potential of another confrontation with Iran at the same time. And the possibilities of Sunni-Shia explosion that were to come out of that other confrontation nobody should underestimate. So that’s again why the potential of this agreement is so important in geostrategic terms. MR HAASS: If you don’t get the congressional vote, does it have an effect on your ability to act outside the Middle East? SECRETARY KERRY: Oh, absolutely. Of course it does. I mean, it’s a repudiation of President Obama’s initiative and a statement that when the executive department negotiates, it doesn’t mean anything anymore because we have 535 secretaries of state. (Laughter.) That’s why. MR HAASS: I apologize. I know the Secretary has got a busy day of meetings. We got to a lot of it but not to all of it. The debate will continue over the next several months, but thank you, sir, for coming here.